Uneasy is the head that wears the crown. 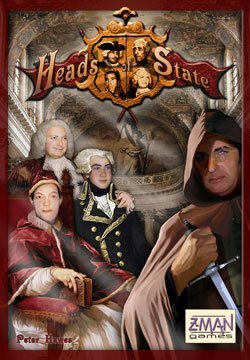 No truer words have been spoken and you can see why in Heads of State, the new game designed by Peter Hawes, that places players in the roles of heads of noble houses trying to populate Western Europe with members of their families and exert influence throughout the lands while trying to keep their heads amidst treachery and assassination attempts. Heads of State comes in a large box that holds three decks of cards (Attribute, Treachery and Noble), lots of noble counters in player colors (as well as one wooden scoring marker which begins on the game’s perimeter scoring track at zero and three cubes per player), various scoring markers, a black bag, an excellently organized rulebook (with plenty of examples) and a large board showing Western Europe, in particular Britain, France, Spain and, because the time frame of the game is the 1500s, 1600s and 1700s, the German States. These areas contain boxes that represent provinces (with room for up to two specific types of nobles) and a capitol (which may hold one or two nobles including a king). Scoring markers are placed in their specified spaces on the board and the Attribute deck is shuffled with 11 cards removed. A Revolution card is shuffled into those 11. These 12 cards are placed aside, only to come into play when the Attribute deck runs out. Six cards are drawn from the Attribute deck to form a tableau. Similarly, the Treachery deck is shuffled but only two cards drawn to form another array. Nobles come in seven varieties, ranging from Baron (the lesser of the group) to King (the top valued noble). Noble cards for each type are placed in separate piles by the board. All players receive a play mat that serves as a staging area for stacking their own color-coded noble counters. The goal is to get your nobles onto the board to exert influence. So how do you go about doing that? That’s where those Attribute cards come in. A player has several options each turn. What a player will do in the early part of the game is draw three Attribute cards, either from the array or, drawn blind, from the top of the Attribute deck. There are 9 types of attribute cards: Gold, Bishop, Title, Troops, Skills, Castle, Science, Palace and Courtesan. In order to create a noble, a player must create a “meld” of the required Attribute cards. 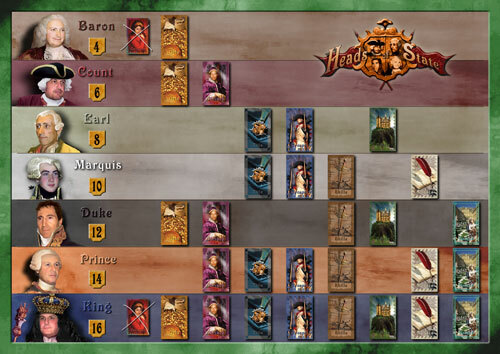 Each play mat details the melds required, ranging from one gold card for a Baron to one each of ALL types (except the Courtesan) to create a King. Courtesans act as “wild cards” and may be used, one to a meld, for ANY noble except the Baron or King. 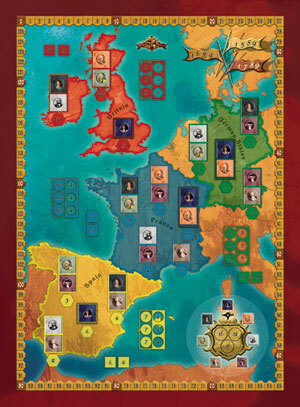 Once created, the player receives a Noble card matching the noble created and immediately places that noble (of his color) on any empty space in any country on the board that bears that noble’s likeness. If so desired, a player may “flush” the cards on display to reveal six new Attribute cards but may then draw only one new card. Multiple melds may be done each turn. But what happens if there is no empty space for a particular type of noble to occupy? That’s where those Treachery cards come in. The third option available to a player in a turn is to draw ONE card from the Treachery deck (from the two revealed Treachery cards or one, sight unseen, from the top of the Treachery deck) AND one card from the Attribute deck. The Treachery deck consists of three types of cards: country specific cards, dual country cards and the Assassin. By playing one country specific card, you may remove ANY noble occupying a space in any province of that country; playing two of these cards will remove a noble occupying a space in the capitol. Dual country cards act the same way but they may be used in either one of the two countries shown on the card. The Assassin works a little differently. Victory points come from a variety of sources. The first player to place a noble in a province or capitol gains the linked scoring marker and its Victory Points. (Only the first player to do this gets those points; subsequent nobles receive no such award). The first two players who manage to place a noble – either dead or alive – in EACH area of a country also receive a scoring marker and those points are immediately added to their scores. The first three players to create a “Noble House”, that is, creating at least one of each of the seven types of nobles scores: 16 points to the first player, 12 to the second and 8 to the third. Play continues until the draws of Attribute cards are taken from the Revolution deck. When the Revolution card appears, play is suspended and the round ends. Now, influence is determined for each country. In each province of a country, two Influence is awarded if only one noble is present. If two nobles are present, the highest ranking noble gets 2 Influence; the lower ranking noble 1. In the capitol, if only one noble is present, 4 Influence is awarded; if two nobles are present, the highest ranking noble gets 4 Influence; the lower ranking noble 2. The player with the highest influence receives that country’s influence marker (and the corresponding Victory Points) with the player with the second most influence getting the lesser value. (Ties are broken in favor of the player controlling the highest valued noble.) Values for countries differ ranging from a mild 6-5 difference for the German States to 7-4 for Spain, 8-3 for Britain to a significant 10-2 differential for France. The end of a round also means a scaling back of player hands down to a limit of 6 Attribute and 2 Treachery cards. All Attribute cards are reshuffled and a new Revolution deck created. The two displayed Treachery cards are discarded, two new ones revealed and the next round begins. (The Treachery deck is only reshuffled if necessary.) When the Revolution card is drawn for the third time, the game IMMEDIATELY ends and final scoring occurs. Final scoring begins with influence calculated and Victory Points awarded for the third and final time. Players now compare Noble cards earned as this is the final source for VPs. Bonuses are earned to the player who managed to create the most of a particular type of noble. The most Barons, for example, earn that player 4 bonus points, the most Counts 6 and so on, up to 16 for the most Kings. If two players are tied, the bonuses are split equally. Should 3 or more players tie, NO bonuses are awarded. The player with the highest accumulated Victory Point total wins the game. Heads of State exhibits a dual nature. In “phase 1”, you try to populate Europe with as many nobles of your family as possible to spread influence and gather up bonus points for being the first in a province or capitol. But as the board fills up, the game enters “phase 2” as you need to remove other players’ nobles (through treachery and/or assassination) to open up spots for your royals. Being first to claim an area is important in getting off to a good start. Whether the nobles are dead or alive is also important. Only “live” nobles exert influence to help you earn those country bonuses but “dead” nobles (their counters stay on the board, face down, so you can track your progress) count towards the bonuses possible for having nobles in ALL areas of a country. That’s why assassinations have an important but not a game-breaking effect. No matter what you do, you cannot prevent treachery or assassination of your nobles. What’s important to remember is that you can still win even if your nobles seem to have targets on their backs. Although a board game, the engine that drives it is card play and the use of card melds to generate nobles works exceedingly well. Of course, any time you draw cards, there is a certain luck element involved. But this is mitigated by the ability to turn from one noble meld to another rather easily. You’re not necessarily “locked in” to a set of cards. Of course, you might feel the pressure if you need a particular noble to complete your “Noble House” or a particular attribute to meld a noble to replace an enemy noble and increase your influence in a region. The ability to flush the cards on display to help obtain that one last card needed for a particular meld can help in cases like that. While the game design is exciting, engaging and excellent, such positive remarks cannot be said for the graphics. For some reason, it was decided to superimpose likenesses of contemporary gamers and friends onto the bodies of 16th and 17th century nobles. It must have seemed like a good idea at the time. It wasn’t. Chalk this up to an inside joke gone terribly wrong. What also hurts is that the counters for each player are identified solely by the borders. These borders tend to get overwhelmed by the counter designs and become hard to identify when you’re trying to see who controls what in each area, a key element that should be easy to see at a glance. The artwork on the board and counters should have been handled much differently and a whole lot better. (I’m no graphic artist but the 7 types of nobles each start with a different letter. It would have been a simple thing to use letters to match nobles to make identification easier.) Another graphic failure involves the cards. For some reason, icons were not used on card corners (as in regular playing cards) so that you cannot hold cards as you would a poker hand. Instead, you have to fan the cards to see what you have. An unnecessary annoyance. But not everything falls short. The colors used for the countries on the board are easily distinguished and the different shaped scoring markers (hexagon province/capitol markers, square area markers, circular influence markers) work well in set up. Keeping won markers in front of you to double-check scores on the scoring track is a simple but excellent idea as well.